Know of any outlets for Pfaltzgraff discount dinnerware? The best place to find Pfaltzgraff discount dinnerware is on the company's website. There used to be Pfaltzgraff dinnerware outlet stores all over the United States; however, in 2008 the outlets were closed because the company decided to focus their efforts and resources on internet marketing. With the way that technology has advanced and the preference of many shoppers to browse the internet for products, this decision only makes sense. I am certain that this move saved the company loads of money since they were running over 70 outlet stores and those savings can only be good for us, the consumers. 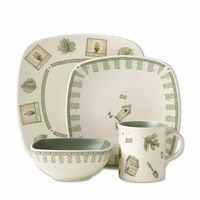 If you are looking for Pfaltzgraff dinnerware, I highly suggest that you order directly from The Pfaltzgraff Company . 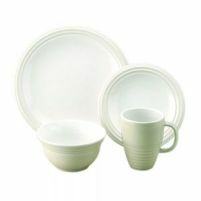 I recently bought a Cappuccino casual dinnerware set from Pfaltzgraff. I bought it through an internet special that I got notification of through email. I was able to get a dinnerware service for 16 plus a service for 16 of flatware from Lifetime Brands at an enormous discount. I really like my Pfaltzgraff dishes and you can't beat the service. If you are hesitant about ordering online, you can call the company to place an order. They do still have excellent customer service in addition to their high quality dinnerware selection. When I got my set, the dishes were packed appropriately to prevent damage to the dinnerware. A catalog of their products was included along with use and care instructions for the particular dinnerware pattern that I chose. To be informed about the discounts offered by the internet-based Pfaltzgraff outlet, simply sign for special offer emails. Shopping for Pfaltzgraff discontinued dinnerware is also a great way to get discounts on awesome dishes. Dinnerware from Pfaltzgraff can also be found on Amazon and eBay is a great place to shop for retired patterns or replacement pieces. The patterns from Pfaltzgraff are pretty amazing. They are very good at keeping up with the trends and producing up-to-date patterns of modern dinnerware.